‘Start up’ the name itself has a tinge of excitement to it. It immediately sets your mind racing to some big names like Steve Jobs, Bill Gates, Mark Zuckerberg, Narayana Murthy among others. There is something romantic about working for or in a start up. But far beyond the romance and the drama startups are very important for any economy. And closer home they might be the big driver for the next stage of growth of the Indian economy. The current favorites in India are undoubtedly Flipkart and inMobi with valuations of $800 million and $1 billion respectively. In the past firms like Naukri.com, Bharat Matrimony and Just Dial have made it big as well. And few like Redbus have got some great exits! Startups in India have some very interesting demographics. Almost 41% of them are founded in Bangalore. Almost 33 % of the start-ups are in the E commerce space. As always India leads in the number of technology startups with almost 379 technology firms started. But in less than a year almost 87 of them shut shop. 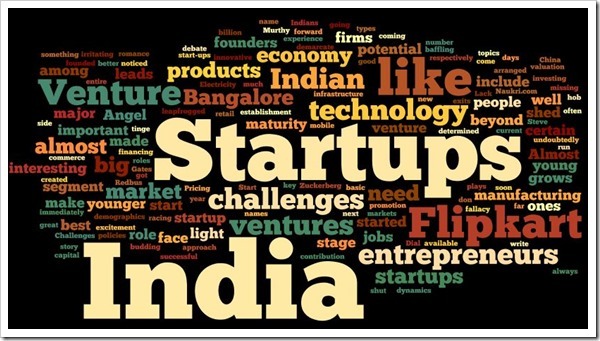 Start-ups in India face many challenges a few major ones include. 1. Infrastructure- India has infrastructure issues and that includes basic requirements like Bandwidth for Internet, Roads, Electricity and Ports. This plays a major role in delaying the route to markets for new products. 2. Lack of maturity- As India leapfrogged the manufacturing wave and totally missed the pc revolution, there is a certain degree of maturity that is missing that would help the budding ventures. Currently almost all manufacturing in technology and electronics is being done in China as India does not have the efficiency on its side to manufacture these products. 3. Policies- The policies made by the Indian administration are baffling at best. To add to the potential confusion with FDI in retail, the Indian establishment has started charging a 30 % tax on Angel investing beyond a certain value as determined by the fair valuation. This is going to make things very irritating and tedious. 4. Social Challenges- Traditionally Indians love secure jobs and founders especially the young ones might face social challenges like the inability to find a arranged match in the marriage market in India. Despite these challenges, Startups are important for the economy as they create jobs and unlock the underlying potential in the Indian market. Also these entrepreneurs have created an entire market segment through innovative approach to fundamentals like Pricing, Merchandising, product development and promotion. Also, it is very much a developing story and as India grows so will the contribution of its entrepreneurs. In the coming days I will shed some more light on the dynamics of this interesting segment in India. Some of the key aspects I will cover include the role of the management team in a startup. It is often noticed that the founders don’t demarcate roles and responsibilities among them very clearly and this leads to challenges as the venture grows. It is a fallacy that startups are best run by younger entrepreneurs. Some ventures work well with more technology savvy younger promoters but there are others that need people with experience. Also what kinds of leadership qualities are required to steer a startup to safety? Do they need to be visionaries or just very good people managers? What about the age old debate between products and services? What type of ventures does better in India, and what would we need to make a India a very successful hub for both these kind of ventures. We will shed some light on the types of financing options available to young entrepreneurs. When do Angel investors come in and at what stage should you start looking for venture capital. Please do write in with your suggestions on this series and the topics you would like to be covered under this. Looking forward to conversing with you soon. YouTube Now Has Over 10,000 Full Length Indian Movies! 1. India should come up with Startup SEZ’s. Where a small space available with all the infrastructure like internet etc with a resonable price. 2.India can able to taste the successes in Pharma industry by reverse engineering and plyaing a key role in Generic Pharma market. The other industries should follow the same strategy to catch the global market. Which China can able to replicate successfully. 3.Though the political scenario is dynamic in India , A Standard 20 year policy which can facilitate the FDI & Other Investors will give some certainity for the Investments. 4. Many start-ups came from University level, do we have any start-up from University.